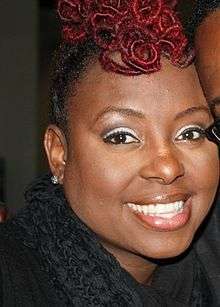 Ledisi Anibade Young (/ˈlɛdᵻsiː/; born March 28, 1972) is an American R&B and jazz recording artist, songwriter and actress. Her first name means "to bring forth" or "to come here" in Yoruba. Ledisi is known for her jazz influenced vocals. In 1995, Ledisi formed the group known as Anibade. After unsuccessfully trying to get the group signed to a major label, she formed LeSun Records with Sundra Manning. Along with her group, Anibade, Ledisi released an album titled Take Time. The album gained major airplay from local radio stations. She is a nine-time Grammy Award nominee. In 2000, Ledisi released her first album, titled Soulsinger: The Revival. Ledisi and her group toured in 2001, performing various shows. In 2002, Ledisi released her second album, Feeling Orange but Sometimes Blue. The album won her an award for "Outstanding Jazz Album" at the California Music Awards. In 2007, Ledisi signed a major record deal with Verve Forecast and released her third album in August of that year, titled Lost & Found, which sold almost 217,000 copies and earned her two Grammy nominations, including one for Best New Artist. In 2008, Ledisi released her Christmas album, It's Christmas. In 2009, Ledisi released her fourth album Turn Me Loose, which earned her two Grammy nominations, followed by her fifth album Pieces of Me (2011) which debuted in the top ten of the US Billboard 200 album chart at number eight, becoming her first top-ten album of her career and her highest-charting album to date. It also garnered three Grammy nominations at the 54th Grammy Awards including for Best R&B Album. In 2013, she received a nomination for Best R&B Performance at the 55th Grammy Awards for her collaboration with fellow R&B and jazz musician Robert Glasper for the album cut "Gonna Be Alright" off of his Grammy Award-winning fifth album Black Radio (2012). In 2014, she released her sixth album The Truth to critical acclaim and moderate sales. She portrayed legendary gospel singer Mahalia Jackson in the Martin Luther King, Jr. 2014 biopic, Selma. Ledisi was born in New Orleans, Louisiana. She grew up in a musical family; her mother, Nyra Dynese, sang in a Louisiana R&B band and her stepfather, Joseph Pierce III, (deceased) was a drummer in the New Orleans area. Her biological father is soul singer Larry Sanders, the son of blues singer Johnny Ace. He left the family when she was a baby and they did not meet again for nearly three decades. Ledisi first began performing publicly at age eight with the New Orleans Symphony Orchestra. Ledisi moved to Oakland, California, where she attended McChesney Junior High School, now Edna Brewer Middle School, where she was shy about her singing abilities. She would sing only upon request when students in her gym class would implore her to sing Deniece Williams' version of Black Butterfly, bringing the entire locker room audience under the spell of her very mature, melodious voice. As she sang more publicly her music career blossomed. She was nominated for a Shellie award in 1990 for her performance in a production of The Wiz and performed in an extended run with the San Francisco cabaret troupe, Beach Blanket Babylon. She studied opera and piano for five years at University of California Berkeley in their Young Musicians Program. 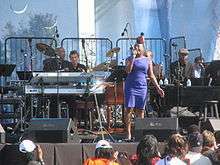 In the 1990s, Ledisi formed a group called Anibade, alongside Sundra Manning (producer, keyboards, songwriting), Phoenix (LaGerald) Normand (background vocals, songwriting), Cedrickke Dennis (guitar), Nelson Braxton (bass), Wayne Braxton (sax), and Rob Rhodes (drums), playing a jazz and hip-hop influenced kind of soul. The group won acclaim in the Bay Area with a cult-like following of die-hard fans who referred to themselves as "Ledites" and meet her with love at every event, singing along verbatim to songs that though unrecorded at the time, were well known by their fans. The group later recorded a demo of one of the songs from their set, entitled, "Take Time" which was played on local stations and requested non-stop. Ledisi tried to get the group signed to a major label, but had no luck. Ledisi also performed often with jazz saxophone giant Robert Stewart throughout the early 1990's in San Francisco. In January 2000, Ledisi released her first album, Soulsinger: The Revival, independently on her label, LeSun Records. The album spun off four singles, "Soulsinger", "Take Time", "Get Outta My Kitchen", and "Good Lovin'". After the release of Soulsinger: The Revival, Ledisi toured with her group Anibade. In 2002, Ledisi released her second album, Feeling Orange but Sometimes Blue, which was also released independently. The album featured the singles "Feeling Orange but Sometimes Blue" and "Autumn Leaves". During this time she also recorded commercials for the Sci Fi Channel. In 2003, Ledisi won "Outstanding Jazz Album" for Feeling Orange but Sometimes Blue at the California Music Awards. During her five-year hiatus, Ledisi made appearances on soundtracks. In 2007, she signed with Verve and released "Blues in the Night" which featured on the tribute album, We All Love Ella: Celebrating the First Lady of Song. In August 2007, Ledisi's third album, Lost & Found, was released. During her hiatus, Ledisi stated that she was unsure of wanting to stay in the music industry. In response, Ledisi wrote the song "Alright" to express her life. "Alright" became the lead single and debuted at #45 on the Billboard Hot R&B chart. The album's second single, "In The Morning", debuted at #49 on the Billboard Hot R&B chart. Other songs from the album charted but were not released as singles. "Think of You" charted at #71 on the Hot R&B charts, "Joy" charted at #103 on the Hot R&B charts and #29 on the Adult R&B Airplay. In December 2007, the album earned her two Grammy nominations, including one for Best New Artist. In 2008, Ledisi continued her tour to promote the album, Lost & Found. By January 2009, the album had sold 216,894 copies. In September 2008, Ledisi released her Christmas album, It's Christmas, which featured the singles "This Christmas" and "Children Go Where I Send Thee". In December 2008, Ledisi's T.V. special aired on Gospel Channel, titled "Ledisi Christmas". Ledisi performed a few songs from her Christmas album. "Have Yourself A Merry Little Christmas" and "Give Love On Christmas Day" charted on the Hot R&B charts at #113. In 2008 Ledisi performed the song "The Man I Love" as a blues singer in the Leatherheads movie. In 2009, Ledisi's fourth studio album was announced to be titled, Turn Me Loose. The album was released on August 18, 2009. Speaking in April 2010 to noted UK R&B writer Pete Lewis – Deputy Editor of the award-winning Blues & Soul – Ledisi explained the album's title reflected its musical diversity: "The title 'Turn Me Loose' is basically me saying 'I don't wanna be boxed in! Let me be myself as a performer and singer, because I do EVERYTHING! Not just one particular style!'." She employed production from seasoned Rhythm and Blues songwriter-producers such as Raphael Saadiq, Jimmy Jam and Terry Lewis, James "Big Jim" Wright and Carvin & Ivan. The first single from the album was "Goin' Thru Changes". The second single was chosen to be "Higher Than This", produced by Jimmy Jam and Terry Lewis and James "Big Jim" Wright. On May 13, 2010, Ledisi performed at Charter Oak Cultural Center's 9th Annual Gala, a fundraiser for free after-school youth arts programming in inner-city Hartford. She performed several songs from Turn Me Loose, and also performed a duet with Anika Noni Rose, a tribute to the late Lena Horne. Ledisi toured with R&B/soul singer Kem on his North American INTIMACY Tour. On March 10, 2011, during her opening act in Atlanta, Georgia, Ledisi announced that she had finished recording her fifth studio album, Pieces of Me, on March 9, 2011. It was released on June 14, 2011. It debuted at number 8 on the Billboard 200 album chart, selling 38,000 copies in its first week. The album's title track served as the album's lead single. Ledisi has performed at the White House seven times at the request of President and First Lady Obama. Ledisi headlined her first tour to promote her album, Pieces of Me. The Pieces of Me Tour played to 22 sold out shows across North America. With this album, she received three nominations for the 2012 Grammy Awards, in the categories Best R&B Album, Best R&B Performance and Best R&B Song, for the album and the lead single "Pieces of Me". Ledisi will release her first book, Better Than Alright: Finding Peace, Love & Power on Time Home Entertainment, Inc. in 2012. The book, an innovative collaboration with ESSENCE, is filled with the singer's personal photos, quotes, lyrics and richly detailed stories of the Grammy nominee's journey to acceptance of her beauty, talent and power. On April 6, 2012, Ledisi announced her second headlining tour, B.G.T.Y., with Eric Benet serving as an opening act. In December 2012, VH1 announced that Ledisi would perform at their 2012 VH1 Divas show, a concert benefiting the Save The Music Foundation charity. Ledisi performed a Whitney Houston tribute medley with Jordin Sparks and Melanie Fiona. On March 2014, Ledisi released her new album The Truth. She is also on tour with Robert Glasper in partnership the magazine "Essence" (which featured her on one of their three April covers as well as Erykah Badu and Solange Knowles). In April 2014, Ledisi was cast to play Mahalia Jackson in the American historical drama film, Selma, directed by Ava DuVernay and written by Paul Webb and DuVernay. It is based on the 1965 Selma to Montgomery voting rights marches led by James Bevel, Hosea Williams, and Martin Luther King, Jr. In the film and on the official film soundtrack, Ledisi sings "Take My Hand, Precious Lord". Initially slated to perform at the 57th Grammy Awards as part of a tribute to the Selma March alongside Common and John Legend (who performed their Oscar-winning duet "Glory") she was ultimately snubbed by the Recording Academy and recording artist Beyoncé, who performed in her place. Ledisi's snubbing and Beyoncé's performance received mixed reaction from social media. In 2015, she received her ninth Grammy Award nomination for Best R&B Performance for the single "Like This" off of her seventh album The Truth. She lost to Beyoncé and Jay Z for "Drunk in Love". Ledisi is currently working on her eighth studio album to be released in late 2015 or early 2016. Ledisi has been nominated for nine career Grammy Awards. ↑ "The Evolution Of Ledisi". bet.com. Black Entertainment Television. Retrieved January 2, 2015. 1 2 "The Truth According to Ledisi". Grammy Awards. April 11, 2014. Retrieved February 7, 2015. ↑ "Singer-songwriter Ledisi". PBS. March 26, 2014. Retrieved February 7, 2015. 1 2 Gardner, Elysa (January 22, 2008). "On the verge: Jazzy vocalist Ledisi just might be best new artist". USA Today. Retrieved February 7, 2015. ↑ Ledisi to return in August – hear a sample!. Soultracks. Retrieved: June 19, 2009. ↑ Hobdy, Dominique (April 25, 2014). "Ledisi to Play Mahalia Jackson in MLK Biopic, 'Selma'". Essence. Retrieved February 10, 2015.